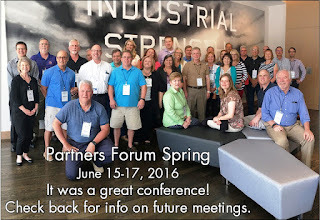 Based on comments like “Great topics and venue” and “Well worth the trip” we can declare Partners Forum Spring 2016 in Denver a success. 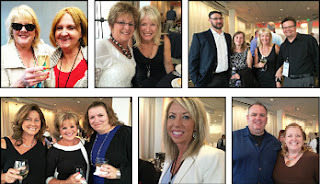 “I enjoyed the conference and networking with everyone” and “Glad that I attended – we never know it all! Still learning after 43 years!” Our members clearly see the value of attending an INPACT conference. With meaty topics like Succession Planning, Cybersecurity and the compelling Economic Data Survey our members were engaged and attentive. The star of the conference however, was Jeff Nischwitz whose topic “The Future of Leadership for Accounting Firms” kept the entire room spellbound! So much that we are in the process of planning to have Jeff return in November for a special “Learn & Leave” presentation that will be open to a broader audience of our membership. Watch for further details on this! While the members were busy in the conference room, many of their companions braved an unseasonably hot day for an extended walking tour of downtown Denver. Those that demonstrated the greatest stamina ended the tour by climbing the 99 steps to the outside walkway around the dome. The views were spectacular! Equally important to the success of our conferences is the opportunity for members to socialize and network. The trusting relationships built over the years between INPACT members are key to the value of our association. Help, advice and information is always just a phone call or email away. After a full day of meetings, our delegates along with their spouses enjoyed the short and pleasant stroll from the hotel to the Denver Art Museum for drinks, dinner and conversation. Following dinner, we were invited to tour the Western American Art Gallery, an exhibition of art created about the American West, its people, its history and its landscape. With two full days of meetings complete, most of our members were ready to board Banjo Billy’s Bus for a bit of a wacky ride to tour and sample the wares at three breweries. Denver is the Napa Valley of Beer. The average person will have 14 jobs by age 38. Focus on client solutions, not client services. If you don’t have a commitment with a deadline – you don’t have a commitment! The bad guys are now hacking people, not technology. Don’t be like Prince – have a succession plan. In Denver you can SMOKE grass but you may not WALK on grass! For more information, consult with Bruce Levine. Many elements combine to make a conference a valuable and successful experience. The speakers, the location and accommodations, the opportunity to socialize and network are all critical factors. However, we must appreciate and thank our sponsors! Let’s give a huge shout out to our Pinnacle Sponsor, Kim Lochridge of Engineered Tax Services. Kim has become an INPACT conference regular and has built valuable relationships with many of our member firms. So, what was all that commotion in the hotel lobby on Thursday night? Kim and her husband Dave were not able to arrive at the hotel until almost midnight on Thursday. Imagine their surprise to find a rather large crowd of INPACT friends waiting for their arrival as they stepped off the elevator! This seems to perfectly demonstrate that many trusting and valued relationships are formed through INPACT membership! CAMICO has been a longtime supporter of INPACT conferences! 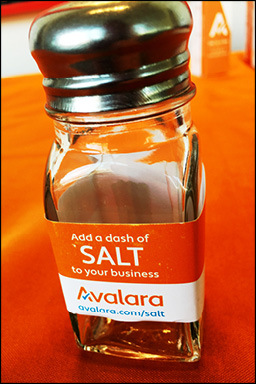 Brandon Houk, representing Avalara provided us with an amusing “Dash of SaLT”.